The Guatemalan military has seized the Alta Verapaz province claiming it is dominated by the Los Zetas drug cartel. A state of siege allows the army to detain suspects without warrants, conduct warrantless searches, prohibit gun possession and public gatherings, and control the local news media. 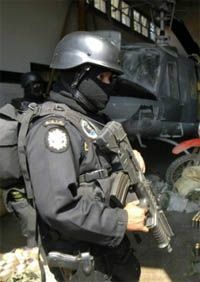 Guatemalan law allows the measure amid acts of terrorism, sedition or "rebellion," or when events "put the constitutional order or security of the state in danger." The state of siege...is meaningless "if we continue to have police corruption, a weak justice system and weak jails," added David Martinez Amador, an analyst and expert on criminal behavior.